The second suspect behind the Boston Marathon bombing, Dzhokhar Tsarnaev, has been arrested following an extensive manhunt that ended in the Boston suburb of Watertown. His brother Tamerlan was pronounced dead by law enforcement early Friday. 19:09 GMT: The parents of the Tsarnaev brothers, Anzor and Zubeidat, have left their home town of Makhachkala for Moscow from where they plan to take a flight to the US in order to meet with their son, Dzhokhar, RIA-Novosti reports. 18:59GMT: US intelligence agencies added the mother of the Boston bombing suspects, Zubeidat Tsarnaeva, to a federal terrorism database, TIDE, about 18 months before the attack occurred, AP cites two unnamed government officials. 23:55 GMT:In a direct contradiction to Boston Police Commissioner Ed Davis, who had stated that shots were fired from inside the boat where Dzhokhar Tsarnaev was apprehended, officials disclosed to the AP that he was unarmed at the time of arrest. 23:30 GMT: Federal investigators have disclosed that the homemade, pressure-cooker bombs were triggered by a remote detonator, the AP reports. The “close-controlled” devices are described as the sort used in remote-controlled toys. According to one US official, the suspects would have had to be several blocks in proximity to the explosives to detonate them. The AP also reports that Russian officials approached the CIA months after the FBI had cleared Tamerlan Tsarnaev in an investigation into possible terrorist ties. The CIA then added the suspect's name into its massive Terrorist Identities Datamart Environment database. Russia’s initial warning to the FBI was shared in March 2011. 20:20 GMT: American authorities have informed the suspects’ family that they may now access older brother Tamerlan's body for burial, though an uncle’s request to a Boston-area mosque for a funeral was denied, according to their aunt Patimat Suleimanova. The mosque, which is run by the Islamic Society of Boston, did not respond to a request by NBC News, though the group did say that its congregants had been questioned by the FBI. Tamerlan Tsarnaev had attended and occasionally caused disruptions at the mosque, after which he was threatened with ejection. 18:50 GMT: The Boston Marathon explosions were triggered by a remote-controlled detonator, AP quotes the US officials close to the ongoing investigation as saying, adding that the bombs were not very sophisticated. One of the officials described the detonator as "close-controlled" — meaning it had to be triggered within several blocks of the bombs. It was not immediately clear what the detonation device was. A criminal complaint outlining federal charges against the only surviving suspect, Dzhokhar Tsarnaev, described him as holding a cellphone in his hand moments before the first explosion. Our firm is representing Katherine Russell and she has asked us to make a short statement. As you know from news reports, Katie married her husband in June of 2010. Since then, she has been living in Cambridge, raising her child and working long hours, caring for people in their homes who are unable to care for themselves. Katie grew up in Rhode Island and has always remained close to her parents and sisters here, as well as her extended family. She is fortunate to have the support of her loving family now, as they, too, struggle to come to terms with these events and the deep sorrow we all feel following the events of last week. Meanwhile, she is doing everything she can to assist with the investigation. The injuries and loss of life — to people who came to celebrate a race and a holiday — has caused profound distress and sorrow to Katie and her family. The reports of involvement by her husband and brother-in-law came as an absolute shock to them all. As a mother, a sister, a daughter, a wife, Katie deeply mourns the pain and loss to innocent victims — students, law enforcement, families and our community. In the aftermath of this tragedy, she, her daughter and her family are trying to come to terms with these events. 19:32 GMT: Homeland Security Secretary Janet Napolitano told a Senate Judiciary panel that an immigration bill currently making its way through congress could fix border control weaknesses which might have facilitated last week’s Boston Marathon bombings. "The bill will help with this because it requires that passports be electronically readable as opposed to having manual input," Napolitano testified, adding the legislation "really does a good job of getting human error out of the process." Previously, Republican Senator Lindsey Graham revealed that a misspelling of Tamerlan Tsarnaev's name on flight records when departing the United States for Russia last year may have allowed him to avoid detection from authorities. Tsarnaev had been put into the Treasury Enforcement Communications System, which helps US officials screen individuals arriving to the country, following a 2011 interview with the FBI. 18:23 GMT: Lawyers for Katherine Tsarnaeva, widow of the slain Boston bombings suspect Tamerlan Tsarnaev, have said that she is doing everything she can to assist authorities. Tsarnaeva said it had come as an absolutely shock to her that either her husband or brother-in-law had played any role in last week’s deadly blast. Her lawyers continued that she is “trying to come to terms with these events.” It remains unclear to what extent she has helped authorities, as her attorneys would not comment on whether she had already spoken with federal investigators. 17:36 GMT: Eight-year-old Martin Richard, the youngest victim in the Boston Marathon bombings, was laid to rest during a private funeral on Wednesday morning. "We laid our son Martin to rest, and he is now at peace. We plan to have a public memorial service in the coming weeks to allow friends and loved ones from our community to join us for a celebration of Martin’s life," WCVB Boston cites a statement by the family as saying. The Richard’s family thanked the outpouring of “love and support” they had received over the last week. They further expressed their faith that the criminal justice system will now “do its job” following the arrest of Dzhokhar Tsarnaev on Friday night. Martin’s mother and sister were among those injured in the dual blasts. 17:00 GMT: The surviving Boston Marathon bombings suspect, Dzhokhar Tsarnaev, told interrogators that US-led wars in Iraq and Afghanistan had motivated him and his brother to carry out last week’s deadly assault, The Washington Post cites US officials as saying on condition of anonymity. The 19-year-old suspect, who is currently hospitalized and in fair condition, further acknowledged his role in planting the explosives near the Boston Marathon finish line last week. The officials, who believe the brothers acted alone in carrying out the attack, believe the pair had been “self-radicalized” as a result of US actions in the Muslim world and information found on the Internet. #Breaking: Condition of #BostonBombing suspect Dzhokhar Tsarnaev upgraded to fair condition, per hospital. 01:54 GMT: Dzhokhar Tsarnaev, the surviving suspect in the Boston Marathon bombings, told investigators that his brother Tamerlan had organized and led the attack that left three people dead and scores injured last week, a US government source told CNN. Tsarnaev met with investigators from his hospital bed Monday, telling them he and his brother worked alone and were motivated by a drive to "defend" Islam from a US attack. Tsarnaev, who is unable to speak because of a gunshot wound in his neck, and his brother also fit the description of lone-wolf jihadists who worked without the backing of a major terror network, the source said. 23:51 GMT: Tamerlan Tsarnaev was known to have argued with and lashed out at a preacher in a local mosque, the Associated Press reports. Before Thanksgiving in November 2012, Tamerlan argued with a preacher who said it was appropriate for Muslims to celebrate some American holidays. This January, he called the preacher a “hypocrite” who was “contaminating people's minds” during a sermon that included praise for Martin Luther King Jr.
22:42 GMT: Evidence from the first interrogation suggests the suspects in the Boston Marathon attack were “motivated by religion” but had no ties to Islamist terror groups, two US officials told the Associated Press on condition of anonymity. While the Tsarnaev brothers - like many Chechens - practiced Islam and appeared to have a strong sense of ethnic identity, the two had only spent a small and early portion of their lives in their homeland. Both were ethnic Chechens, but Dzhokhar Tsarnaev was born in Kyrgyzstan while brother Tamerlan was born in the Russian republic of Kalmykia. By the time of the Boston attack, both brothers had been living in the United States for over a decade. 22:28 GMT: Boston bombing suspect Dzhokhar Tsarnaev has been read his Miranda rights by a US judge during a bedside hearing in the Beth Israel Deaconess Medical Center. 22:07 GMT: The owner of the car hijacked by the two Boston Marathon bombing suspects claims that one of them admitted to carrying out the blasts. “Did you hear about the Boston explosion? I did that,” one of the suspects asked the victim according to a report obtained by The Wall Street Journal. “I am serious,” he added showing the bullet inside his gun’s magazine. 22:01 GMT: A 7-year-old girl remains hospitalized in critical condition with “multiple leg injuries” along with several dozen others who suffered injuries in the Boston Marathon blasts. The Children's Hospital of Boston declined to identify the girl. 21:13 GMT: The first victim of the blast Krystle Campbell, 29, was laid to rest at a private ceremony at St. Joseph's Church in Medford. 18:45 GMT: People in Boston and other cities are observing a moment of silence for the victims of the Boston Marathon bombing, a week after the explosions that killed 3 people and injured more 170 on April 15. 18:44 GMT: Tsarnaev agreed to a probable cause hearing scheduled for May 30, according to the Department of Justice. 18:10 GMT: The 19 year-old Dzhokhar has been charged with using weapons of mass destruction, a federal crime which is punishable by death, life in prison, or any other indeterminate prison sentence, the Justice Department said. In addition to that he has been charged with malicious destruction of property resulting in death. 17:31 GMT: The White House said that Dzhokhar Tsarnaev, the surviving suspect will not be tried as an enemy combatant in a military tribunal. Tsarnaev will be prosecuted in the federal court system as under US law the country’s citizens cannot be tried in military commissions, said Jay Carney, a White House spokesman. He added that President Barack Obama's entire national security team supports the decision. 17:30 GMT: Federal prosecutors charged Tsarnaev while he still remains in a hospital bed in serious condition. "There has been a sealed complaint filed," said Gary Wente, circuit executive for the U.S. Courts for the First Circuit. 16:45 GMT: A misspelling in Tamerlan Tsarnaev’s name kept the FBI in the dark about the slain suspect’s early 2012 trip to Russia, US Senator Lindsey Graham said. Graham continued that it remained unclear whether Tsarnaev had intentionally misspelled his name in order to cover up his tracks. “a marathon”, Dr Terence Keane, a psychiatrist at the Boston Medical Center where many of the injured are being treated, said. "For many people it will be difficult to get back into the normal routine. You may not feel like it, you may not be energized to do this, yet from a set of long-standing scientific studies, the people that do best are the people that get back to normal," Dr Keane said. 16:38 GMT: Dzhokhar Tsarnaev, the surviving suspect in the Boston Marathon bombings, is answering brief questions by nodding his head, a source close to the investigation told CNN on Monday. The source said investigators have questioned Tsarnaev on whether there were more bombs, explosives, weapons caches, or if anyone had helped him and his brother carry out last Monday’s attack. It was not immediately clear what information the suspect, who is currently restrained and on a ventilator, has provided. The source continued that investigators are questioning Tsarnaev every few hours in the presence of doctors. 15:00 GMT: Forty eight people injured in last Monday's attack are continuing to receive inpatient medical treatment, while two remain in critical condition. On Sunday it was reported that fifty two people remained hospitalized, while three were in critical condition. 13:45 GMT: Boston Medical Center's doctors: "It will take months for the victims of the bombing to recover". BROOKLYN: RIGHT NOW - SUSPICIOUS POWDER FOUND IN BROOKDALE HOSPITAL, HAZMAT EN ROUTE. MANHATTAN: SUSPICOUS PACKAGE AT CHURCH ST & WORTH ST.
10:50 GMT: The FBI is disputing a claim by the mother of the suspected Boston bombers, who said the bureau had spoken to the older brother after the bombs exploded at last Monday's marathon. At FBI headquarters in Washington, spokesman Michael Kortan says the bureau's 2011 interview with Tamerlan Tsarnaev was the only FBI contact with him. Kortan is standing by the bureau's public statement from Friday in which the bureau described that interview. That statement says the FBI did not learn of the identities of the bombing suspects, Tamerlan and his brother, Dzhokhar, until Friday, the day Tamerlan was killed. The brothers' parents in Russia have insisted that the FBI continued to monitor Tamerlan after the 2011 interview and say both of their sons were set up. 09:19 GMT: Dzhokhar Tsarnaev remains in a serious condition, reports the FBI at the request of Beth Israel Deaconess Medical Center, where the suspect is being treated. 4:14 GMT: As investigators are struggling to understand the motives behind the deadly Boston bombing, RT spoke to a relative of the suspected attackers who stressed that the elder of Tsarnaev brothers, Tamerlan, was not a religious fanatic. 3:45 GMT: FBI asked Tamerlan Tsarnaev's wife's lawyer if they could speak with her, but he informed them of her refusal. On Sunday, the authorities visited the home of Tsarnaev's in-laws, where Katherine Russell Tsarnaev is currently staying - according to lawyer Amato DeLuca's statement to AP. Having gotten a refusal, they are now discussing how to proceed. Russell-Tsarnaev has been saying that she never suspected Tamerlan of anything and that nothing prompted her to think he was behaving suspiciously even after the bombings. Tamerlan would normally stay at home to take care of their daughter while Katherine was away working. Her lawyer says Tsarnaev was home on the day of Tamerlan's death, as his wife had left for work. 3:00 GMT: The Tsarnaev brothers were allegedly planning to head to New York, having hijacked their Mercedez-Benz getaway car and told the hostage driver of their intentions. That is according to a New York Times' conversation with a US official. This adds to the already existing suspicion by the FBI that the bombing suspects had been planning to kill more people. 1:40 GMT: Dzhokhar Tsarnaev answers questions in writing, as he is asked by police about possible accomplices and other potential unexploded devices - according to tweets from ABC news network. 1:05 GMT: The Tsarnaev brothers were not licensed to carry firearms in the towns where they lived, said police spokesman Dan Riviello. "There is no record of him having a license to carry," Reuters cited Riviello. 23:28 GMT: The Boston Marathon bombing suspect Dzhokhar Tsarnaev is awake and is being questioned by authorities, ABC News reports. This comes after officials said that the alleged bomber was in serious condition and unable to communicate verbally due to a throat injury. He is being treated at Beth Israel Deaconess Medical Center in Boston. 21:30 GMT: Senior members of the US Congress have criticized the FBI for "dropping the ball" on a promising lead back in 2011, when they got word from the Russian government that Tamerlan Tsarnaev is a person of interest and should be interviewed. Michael McCaul, who is the Republican chair of the House homeland security committee, has asked the FBI to provide answers. "He was interviewed by the FBI in 2011 and let go. He travelled back to Russia and spent six months there," McCaul told CNN. Apparently, the FBI never followed up the inverview, but claimed they had found nothing suspicious about Tamerlan at the time, saying on Friday that they "did not find any terrorism activity, domestic or foreign", relating to the older brother's travel records. They declined to give further comments. A Republican senator, meanwhile, was quoted by CNN as saying to the committee that "the FBI missed a lot of things is one potential answer, or laws do not allow the FBI to follow up in a sound, solid way." There will be no press conference or further statement from the U.S. Attorney’s Office this evening regarding the Boston Marathon attacks. 20:38 GMT: Terminal 4 at JFK International Airport in New York City has been fully evacuated after a suspicious package was discovered on Sunday. A source at JFK told WABC news channel that the package was being boarded on to a plane. Bomb squad has arrived at the scene. There have been numerous reports of suspicious unattended objects across the US in the wake of the Boston Marathon bombing. 19:45 GMT: Fifty two victims of the Boston Marathon bombings are continuing to receive inpatient medical treatment, while three remain in critical condition. Three people were killed and more than 180 were injured in Monday’s attack. 18:04 GMT: The FBI’s facial-recognition software failed to identify the suspects on the video taken before the bombing, even though the images of both existed in official databases, Boston police commissioner Edward Davis told The Washington Post. The Tsarnaev brothers could have been found in multiple databases, as both had legally immigrated, while Dzhokhar had a driver’s license, and Tamerlan had been the subject of an FBI investigation. 17:27 GMT: Members of six churches gathered to honor the Boston bombings’ victims at an interfaith memorial service on Sunday. A wake for the bombing victim Krystle Campbell is also being held Sunday at a funeral home in Medford. 15:12 GMT: The bombing suspects killed Officer Sean Collier, 26, of the Massachusetts Institute of Technology campus police on Thursday, said Boston's police commissioner. "Tragically, Officer Collier from the MIT police was murdered by these individuals as they started their rampage," said Commissioner Edward Davis on Fox News Sunday. He added that they had other explosives that the authorities detonated. The authorities believe the suspects intended to use them. "We feel that they had plans to use those explosives, possibly on soft targets," Davis said. 15:10 GMT: Boston’s police commissioner, Edward Davis, says Tsarnaev is still in a serious condition in hospital and authorities have still not been able to question him. He also said that based on the evidence at the scene and the firepower both brothers had in their possession; it was his belief that they “were going to attack other individuals”. 15:05 GMT: US authorities have not yet read Dzhokhar Tsarnaev his Miranda rights. This means that Tsarnaev will not be advised of his right to remain silent or his right to counsel before he is questioned. This is known as a public safety exception to Miranda and will be an important test case of civil liberties and the US legal system. 13:35 GMT: Dzhokhar Tsarnaev, the Boston bombing suspect, remains unable to speak as he undergoes treatment for a gunshot wound to his throat. CBS television quoted investigators as saying that he had lost a lot of blood and one wound in the back of his neck could have been a suicide attempt. A statement released on a website used by Russian North Caucasus rebel groups has denied any link to the Boston Marathon bombings. "The command of the Vilayat Dagestan mujaheddin... declares that the Caucasus fighters are not waging any military activities against the United States of America. We are only fighting Russia," the Kavkazcenter.com website said in a statement. 12:57 GMT: Two alleged friends of Dzhokhar Tsarnaev, owners of a BMW with a license plate “Terrorista #1”, were taken to custody in New Bedford, Massachusetts, on Saturday on charges of violating immigration law, the Daily Mail reports. Both are students, presumed to come from Kazakhstan. Neighbors say their names are Azmat and Diaz. Police say the surviving suspect behind the Boston bombings might have lived with them. The two were first arrested on Friday, but soon released. The Saturday arrest might end up in their deportation. 12:26 GMT: The family of a missing student falsely named as one of the Boston terror suspects were bombarded with hate messages. Sunil Tripathi, a 22 year old philosophy student was falsely identified as one of the suspects on Twitter as photographs of the two wanted men were released by police. His name was circulated among millions of people on social networking sites amid rumors that his name has been over heard on police radio scanners. The fact that he had been missing for a month was cited as corroboration. Eventually Officials from the FBI were forced to name the real suspects, earlier than they had planned. 07:22 GMT: Runners in the London Marathon are being asked to wear black ribbons during the race as a mark of respect for those who died in Boston, reports the BBC. 06:14 GMT:“The place in Watertown where Tsarnaev was arrested on Friday after a two-hour shootout with police,” writes RT correspondent Anastasia Churkina on Twitter. 05:01 GMT: An infrared video was released by the Boston police revealing the hiding place of Dzhokhar Tsarnaev in a boat in the backyard of a house in the Boston suburb of Watertown. "There is no link between the Boston Marathon and the London Marathon and there is no change to the threat level at this time to London," she told the BBC. She added search dogs would be used at the event and urged spectators to keep their belongings with them at all times to avoid sparking a security alert. 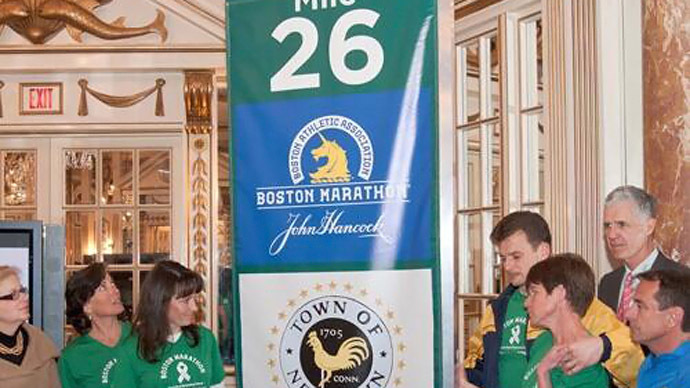 As a mark of respect for the three people that died and the 170 injured in the bomb blasts in the Boston Marathon on Monday, a 30-second period of silence will be held at the beginning of the race. 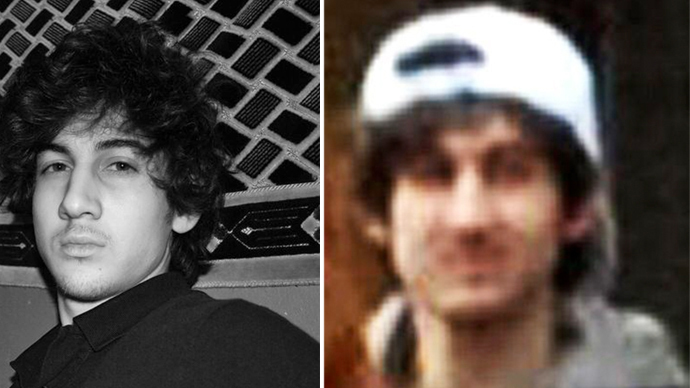 01:18 GMT: The Tsarnaev brothers used their carjacking victim's ATM card before a gunfight with authorities, police say. Watertown Police Chief Edward Deveau says the suspects behind the Boston Marathon bombing also told the carjacking victim they bombed Monday's race and killed a police officer. 00:25 GMT: Dzhokhar Tsarnaev, the suspect behind the Boston Marathon bombing who was arrested on Friday night, suffered a throat injury and may not be able to talk, a federal official told CNN on condition of anonymity. Earlier Massachusetts Gov. Deval Patrick said that Tsarnaev was in a "serious but stable condition" adding that he was "not able to communicate yet." 23:30 GMT: Dr. David Schoenfeld, who was involved in treating the older of the two bombing suspects - 26-year-old old Tamerlan Tsarnaev, said that the man had been so riddled with gunshot wounds on arrival to the hospital that it was impossible to determine which wound had been fatal. The doctor added that if Tsarnaev had been wearing a vest with explosives, he wasn't anymore, upon arrival to the hospital. 20:00 GMT: The infrared photos released by Massachusetts State Police show Dzhokhar Tsarnaev hiding in a boat in the backyard of a house in the Boston suburb of Watertown. 19:12 GMT: Tsarnaev’s condition is "serious but stable’, said Massachusetts Governor Deval Patrick, adding that he is not yet able to communicate,according to US media. 18:27 GMT: The Federal public defender’s office in Boston says it is seeking to represent surviving Boston marathon bombing suspect Dzhokhar Tsarnaev, Reuters reports. Earlier in the day, top Republican senators had requested that Tsarnaev be held as an enemy combatant, a status which would deny him the right to a government appointed attorney and other legal protections. 18:17 GMT: Russia asked the FBI to investigate Boston Bombing suspect Tamerlan Tsarnaev in 2011, a US law enforcement source told Reuters. The FBI had previously reported on its website that an unidentified ‘foreign government’ had inquired about the slain suspects radical Islamist views, further requesting that they agency investigate his links with certain terrorist groups. The FBI says they found nothing suspicious at the time. 18:03 GMT: Top Republican senators urged US President Barack Obama to hold the suspect of marathon bombing Tsarnaev as a potential enemy combatant, US media report. That status will deny him a government-appointed attorney and other legal rights in an attempt for the investigators to learn about other possible attacks. “The suspect, based upon his actions, clearly is a good candidate for enemy combatant status. We do not want this suspect to remain silent,” said senators Lindsey Graham, South Carolina; John McCain, Arizona; and Kelly Ayotte, New Hampshire as cited by the New York Daily News. 17:01 GMT: The FBI asked the Beth Israel Deaconess Medical Center personnel not to give any updates on the condition of the suspect Dzhokhar Tsarnaev, ABC News has reported citing a hospital spokesperson. As of early morning Boston time, the suspect was still alive, the report added. 16:09 GMT: The suspects in the Boston Marathon bombings likely acted alone, according to early indications, the Watertown, Massachusetts, police chief Edward Deveau told CNN on Saturday. 15:04 GMT: The 19-year-old Boston Marathon bombing suspect Dzhokhar Tsarnaev will be questioned by a special interrogation team for high-value suspects, an unnamed US Justice Department official told AP. According to another official DoJ source cited by CNN, federal terrorism charges against Tsarnaev could be filed soon, even as he remains hospitalized. 14:44 GMT: North Korea denied that it has any links to the Boston Marathon bombing, saying it “maintains a stance against any form of terrorism,” as quoted by the KCNA. The statement also said North Korea will not hide behind terrorism if it ever feels the need to strike the US, dismissing the allegations posted on the American news website WND that the country might be behind the bombing as an attempt by “hostile forces” to damage its reputation. 10:12 GMT: Interpol has notified 190 countries of the nature of explosive devices used by the Tsarnaev brothers, as well as provided data on the suspects. The ‘orange notification’ was issued on US law enforcement authorities’ request. 08:13 GMT: Massachusetts police have found seven explosive devices, allegedly made by the Tsarnaev brothers, NBC news reported. The devices were discovered in Dzhokhar Tsarnaev’s flat in the town of Cambridge, and in Watertown. 07:25 GMT: One of the brothers suspected of the Boston bombings, Tamerlan Tsarnaev, faced deportation in 2009 after being convicted of domestic violence. However, he was allowed to stay, government watchdog Judicial Watch indicated. 06:35 GMT: Law enforcement officials in Dagestan, the region where the two brothers come from, are not conducting any investigation over the fact that the suspects lived there for some time. “There are no reasons for us to look into the Tsarnaev family at the moment,” a spokesperson said. 06:26 GMT: Presidents Putin and Obama spoke on the phone following the deadly Boston bombings and the manhunt for suspects, who turned out to be ethnically from the Russian republic of Chechnya. The American leader thanked Putin for his condolences expressed to the US people, with the two presidents agreeing to continue cooperating on counterterrorism and security issues. 06:07 GMT: The FBI reportedly interviewed the eldest of the brother suspects in 2011. Tamerlan Tsarnaev did not produce any "derogatory" information back then, according to a source quoted by Reuters. 05:12 GMT: A doctor who attended Tamerlan Tsarnaev when he got to the hospital provided his account of the events. When Tsarnaev arrived, he immediately went into cardiac arrest. CPR was performed until a team of doctors could attempt to resuscitate him, inserting chest tubes to treat potential injuries. However, Tsarnaev sustained massive, penetrating injuries, and was pronounced dead at 1.35am. His body was then taken by law enforcement officials to be examined by forensics, The Huffington Post indicated. 04:30 GMT: It cost about $333 million to shut down the city of Boston for a day during manhunt, Bloomberg reported. 02:30 GMT: A video from Facebook user Bill Farrell showing mass celebration in the Northeastern University area after Dzhokhar Tsarnaev's capture. Obama said law enforcement worked “as they should” throughout the week-long manhunt, but was careful to stress that the investigation is not over. Obama also reminded the country of the fertilizer plant explosion earlier this week in West, Texas, where 14 people have been killed and others remain missing. The blast “leveled” four blocks of homes, but President Obama pledged federal aid to the region, along with his sympathy. 02:15 GMT: Residents applaud after the capture of the second of two suspects wanted in the Boston Marathon bombings April 19, 2013 in Watertown, Massachusetts. 02:09 GMT: Federal and local law enforcement officials were visibly excited Friday night when they appeared in front of international media with updates on the capture of Dzhokhar Tsarnaev arrest. State Police Col. Timothy Alben, just hours after stating that investigators had no update on the suspect's location, said Tsarnaev was taken into custody after exchanging gunfire with police. “We’re exhausted folks, but we have a victory here tonight,” he said. Boston Police Commissioner Ed Davis said that it was a major priority to apprehend Tsarnaev alive, in part to send a message to the rest of the world that due process is a priority in the United States. “We always want to take all of the suspects alive so that we can find out what happened, why it happened, and take them in for justice,” Davis said. 01:48 GMT: Hostage rescue team tried to talk Tsarnaev out of the boat, but he was "not responsive." 01:45 GMT: The public safety exception is invoked when a suspect is considered an imminent threat to law enforcement or the public. In such cases, according to the FBI, “Miranda warnings need not be provided prior to asking questions directed at neutralizing an imminent threat, and voluntary statements made in response to such narrowly tailored questions can be admitted at trial.” The traditional Miranda rules apply again once the immediate threat is eliminated. 01:44 GMT: Following presser in Watertown, President Barack Obama will speak from the White House on capture of Boston bombing suspect Dzhokhar Tsarnaev at 9:45 pm EDT. 01:40 GMT: Tsarnaev is listed in “serious, if not critical condition” after suffering gunshot wounds to the neck and leg, according to CBS News. 01:37 GMT: Despite earlier reports to the contrary, arresting officers will not read Dzhokhar Tsarnaev his Miranda rights, citing a so-called "public safety exception." The Department of Justice has listed Tsarnaev as a “high value detainee” on their website. 01:31 GMT: US federal agents are planning to closely examine the slain Tamerlan Tsarnaev’s trip to Russia last year, where he may have met with extremists, according to a report by The New York Times. 01:09 GMT: The Obama administration will treat Tsarnaev as a criminal, not an enemy combatant, according to an NBC report. 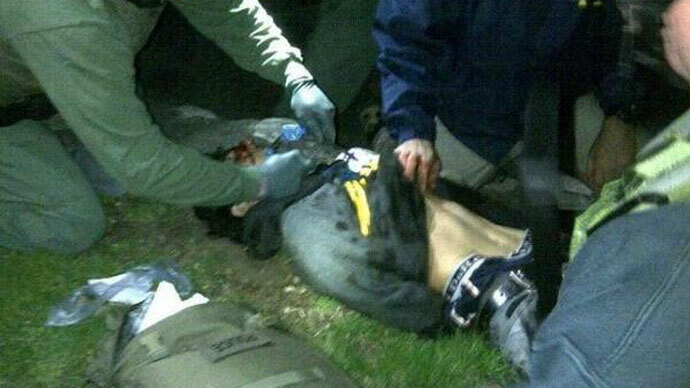 00:44 GMT:Tsarnaev is in custody and alive, although police have requested an ambulance on the scene. Police say the standoff is over. 00:42 GMT: The three individuals detained in relation to the investigation are two men and a woman, according to a CNN report citing the FBI. 00:39 GMT: Petr Gandalovič, the Czech Ambassador to the United States, issued a statement Friday explaining that his country is, in fact, different from Chechnya, where the Tsarneav family is from. Gandalovič added that his country is committed to cooperating with the US on fighting terrorism. 00:34 GMT: Three people have been detained in New Bedford, Massachusetts in connection with the Boston Marathon bombing investigation, the Boston Globe reports. 00:30 GMT: FBI officials confirmed to the Washington Post that Tamerlan Tsarnaev, the older of the two suspects in the Boston Marathon bombing, who was killed Thursday night, was interviewed two years ago in Boston on request from a "foreign government." 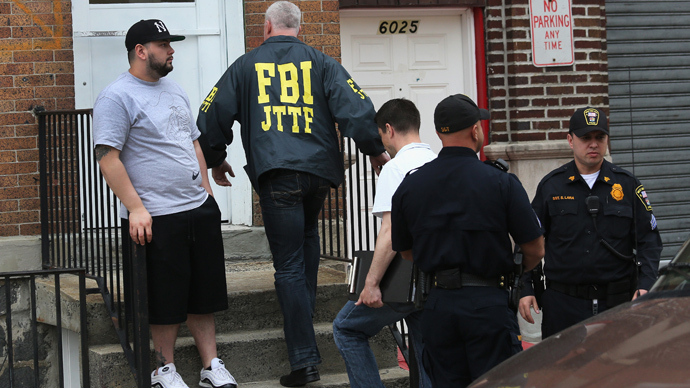 Agents found “no derogatory information” relevant to his suspected terrorist ties. The interview was held in 2011, and the anonymous official would not reveal the terrorist organization in question or the country that requested the investigation. 00:20 GMT: US President Barack Obama thanked Russian counterpart Vladimir Putin for his close cooperation on counterterrorism after the Boston Marathon bombings in a phone conversation on Friday. "President Putin expressed his condolences on behalf of the Russian people for the tragic loss of life in Boston," the White House said in a statement. Obama "praised the close cooperation that the United States has received from Russia on counterterrorism, including in the wake of the Boston attack." 00:15 GMT: A fire has been reported in the boat, as noted by NBC News. Tsarnaev was seen from a police helicopter using thermal imaging technology. 00:01 GMT: Tsarnaev is thought to still be alive, based on a Boston Globe report from a State Police helicopter pilot. Flash bang grenades are known to have been used to disorient him. Meanwhile, a law enformcent official told NBC that the boat has a full tank of gas. 23:51 GMT: A Watertown resident tipped off police that Tsarnaev might be in the area when she noticed a ladder was amiss, according to NBC News. 23:50 GMT: Multiple outlets report that police are working with caution because of the possibility that the suspect is wearing a suicide vest and that the boat could contain full fuel tanks. WFXT, Boston’s Fox affiliate, reported a robot is being sent in. 23:44 GMT: Police have removed a cover from the boat where a man thought to be Tsarnaev is hiding. He is thought to be wounded, with the Boston Globe tweeting, "He's not moving." 23:36 GMT: Contrary to earlier reports, police now say they did find pipe bombs inside the Boston Marathon bombing suspects’ home, according to John Miller of CBS News. A bomb squad also found IEDs along the chase route Thursday night. There was “meant to be a controlled detonation” of the explosives found at their residence. 23:19 GMT: Metro West Daily News reporter Laura Krantz tweets that a suspect has been “found in a boat” and is "likely dead," adding that there is blood on the scene. 23:08 GMT: The Boston Marathon bombing suspect is reportedly "pinned down" under a boat in Watertown, a source has told the Boston Globe. 23:02 GMT: Tactical teams are approaching a boat from which gunshots are reported to have been fired. Multiple EMS teams have been requested to the scene. 23:00 GMT: Multiple media outlets and Twitter users are reporting gunshots near a boat in Watertown, where a perimeter has been established and squad cars are rushing to the area. Police have demanded radio silence on the scanner. 22:23 GMT: Alben said Tsarnaev had fled the firefight with police last night on foot, although where he went from there is unknown. "We cannot continue to lockdown an entire city or state,” he said, advising Boston residents to “remain vigilant." #CommunityAlert: Col. Alben of State Police says the effort was there today unfortunately the result wasn’t. 22:21 GMT: Investigators said they had no reason to believe he had made it out of the Boston area. 22:20 GMT: Col. Timothy Alben of the Massachusetts State Police advised area residents to “go about your business” despite law enforcement’s failure to locate and apprehend Dzhokhar Tsarnaev. 22:13 GMT: Boston-area residents are once again free to leave their homes, public transit running, mayor says. 22:07 GMT: FBI investigators interviewed Tamerlan Tsarnaev about possible extremist ties two years ago, although they found no evidence and closed the file, according to CBS News. 21:46 GMT: No explosives were found on Norfolk Street in Cambridge where the suspects lived. As such, no “controlled explosion” will be necessary, state police told the Boston Globe. However, state police found some 200 spent rounds and evidence of homemade bombs and pipe bombs, as well as a pressure cooker in the wake of the police firefight with the Boston Marathon bombing supects late Thursday night, the Globe reports. 21:43 GMT: US President Barack Obama called Massachusetts Governor Deval Patrick and Boston mayor Tom Menino Friday afternoon to offer his condolences for the MIT police officer slain Thursday night, according to what White House officials told Yahoo News. Officer Sean Collier, 26, was shot and killed during the manhunt while Richard Donahur Jr., 33, is in stable condition at Mt. Auburn Hospital. Obama was most recently briefed on the updates of the manhunt by Homeland Security and Counterterrorism officials in a meeting at 4:00pm EST. 21:28 GMT: Kyrgyz security services have asked that their country not be connected with the Boston Marathon bombers. The family of the Tsarnaev brothers, who are suspected to be behind the attack, lived in Kyrgyzstan for some time. They left the country 12 years ago and moved to Russia’s Republic of Dagestan, before taking residence in the United States. Kyrgyz security services clarified that Tamerlan [Suspect #1] was 15 years old and Dzhokhar [Suspect #2] was 8 years old when the family left Kyrgyzstan. 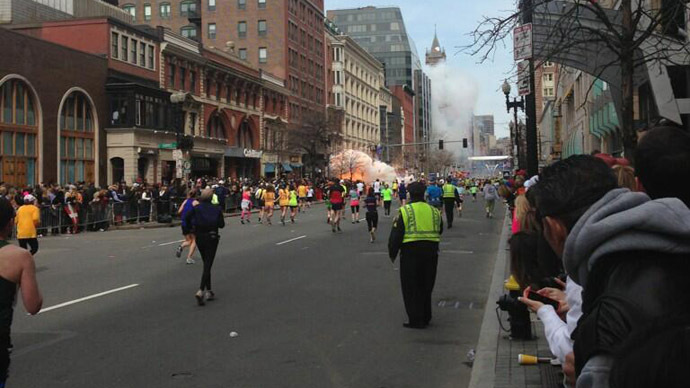 21: 20 GMT: Dzhokhar Tsarnaeva’s Twitter feed has been identified by RT. The suspect is still the subject of a manhunt in the Boston and Cambridge area. 21:18 GMT: Zubeidat Tsarnaeva, the suspects' mother, maintained her sons' innocence in an exclusive interview with RT, adding that they had been wrongly targeted by the FBI. She asserted that American federal law enforcement were aware of her sons' interest in militant Islamism - contending that as a result, it would have been very difficult for them to pull off such an attack. 21:03 GMT: The Boston Marathon bombers are not suspected of involvement in the armed robbery near MIT Thursday night, according to WBZ in Boston. The surveillance image from 7-11 of the brothers was taken after they had already hijacked a car and were putting fuel in it. WBZ’s report was confirmed by multiple media outlets. 19:20 GMT: The suspects' aunt, Maret Tsarnaev, told the Toronto Sun that she believes her nephews were framed. She added that Tamerlan Tsarnaev - the deceased suspect - was a husband and father. 18:52 GMT: ‏"His Twitter account has grown, but Tsarnaev's friend-list on VKontakte has shrunk from 59 this morning to 6 now," @gkates tweeted. 18:51 GMT: 15 police officers were taken to St. Elizabeth's Hospital in Brighton, MA for injuries sustained in last night's police activity, ABC News reported. 18:40 GMT:“I would like to remind people, that starting the 2000s, when there was a war in the North Caucasus, Putin repeatedly said they were not our terrorists or foreign terrorists, [but a universal threat], you can’t differentiate between them – they all deserve aversion,” President Vladimir Putin’s press secretary Dmitry Peskov said in response to the situation with the Boston suspects, who were born in Russia. FBI is questioning in New Jersey sister of suspected Boston Marathon bombers. 17:43 GMT: There will be a controlled explosion in Cambridge, Massachusetts, out of an "abundance of caution." 17:42 GMT: Massachusetts state police say "no apprehension has been made" in search for bombing suspect. State police's Timothy Alben says "60-70% of Watertown has been covered door-to-door, but the hunted suspect has not yet been apprehended." 17:40 GMT: Boston Mayor Thomas Menino "We are city that is not going to let a terrorist take over." 17:21 GMT: Dzhokhar Tsarnaev, 19, became an American Citizen on Sept. 11, 2012, CBS reported. 16:56 GMT:John Kerry says,"It's fair to say that for this entire week we've been in a pretty direct confrontation with evil." 16:42 GMT:The suspects' uncle, Ruslan Tsarni, says he has not seen the suspects in years and is "ashamed." He has urged the suspect-at-large to turn himself in and ask for forgiveness. He said that he wants to meet the victims of the bombing. 16:28 GMT:The suspects' father, Anzor Tsarnaev, told the BBC that his younger son Dzhokhar hoped to become a brain surgeon, and that he believed the secret services had framed his sons. 16:12 GMT:US Secretary of State John Kerry said,"We are part of the way there in bringing the Boston terror suspects to justice." 16:09 GMT: FBI is looking for third suspect in Boston Marathon bombing, NBC reports. 16:01 GMT: Boston Mayor Tom Menino is on his way to the scene of police activity in Watertown, WBZ-Boston reports. 15:58 GMT: A Russian interpreter has been sent to the scene in Watertown, Massachusetts, CNN reported. 15:40 GMT: Boston's Logan Airport tweets, "flights are arriving and departing. Taxis are available, but in very high demand." 15:30 GMT: A Connecticut State Police spokesman says the vehicle in question has been located in the Boston area. The car was registered to the older brother, Tamerlan Tsarnaev. 15:28 GMT: The father of the suspected Boston Marathon bomber has called on his son to give up peacefully, but warned the US that if his son is killed "all hell will break loose," ABC reported. 15:22 GMT: Police are seeking a "1999 Honda CRV with Massachusetts plate: 316-ES9. Color - Gray. Possible suspect car. Do not approach." 15:20 GMT: Connecticut State Police says it is seeking a vehicle that could be occupied by a person possibly linked to the Boston bombing. 15:18 GMT: President Obama is currently being briefed on the situation in Massachusetts. Vice President Biden, AG Holder, and FBI's Mueller are also getting briefed. According to the White House, Obama's briefing is taking place in the situation room. 15:06 GMT: MIT has released the name of a campus officer shot dead last night by the suspects as he sat in his car. The man has been identified as 26-year-old Sean Collier. MIT Chief John DiFava says Collier was a dedicated officer, liked by his colleagues and the MIT community, AP reported. 14:00 GMT: Two unidentified people were taken into custody at the Cambridge, Mass., home where Dzhokhar Tsarnaev and his older brother Tamerlan grew up, but they were not being described as additional suspects. Three dozen FBI agents were surrounding the house, NBC reported. 13:52 GMT: Russia is ready to help US authorities in the investigation, the Russian embassy in Washington said on its Twitter account. 13:30 GMT:"I can't believe this, it's not possible. My nephews can't do this. I don't believe any of my nephews involved in this horrible incident," Alvi Tsarni, who says he is the suspects' uncle, told WBZ CBS news. 13:29 GMT: Transit police officers told the Boston Globe that their colleague who was shot is "going to live" and is "a good, brave dude." 13:28: RT is broadcasting the manhunt, LIVE from Watertown, Massachusetts. 13:14 GMT: The press secretary of the head of Russia’s Republic of Chechnya has stated that the Tsarnaev brothers have had no connections with Chechnya for many years. “The persons in question haven’t lived in Chechnya in their mature years and if they became ‘bad guys’ it’s the responsibility of those who raised them,” Alvin Karimov is cited as saying by Interfax. 13:12 GMT:An uncle of the brothers told AP that the men lived together near Boston and have been in the United States for about a decade. 13:05 GMT: Boston Marathon bombing suspect (Dzhokhar Tsarnaev) is accomplished medical student and 'a true angel', AP quoted father of suspect as saying. 13:03 GMT: Cambridge police report on two possible suspicious packages found on Center Street and Albany Street in Cambridge, Mass. 12:57 GMT: Police took two people into custody at house on Norfolk St, Watertown. FBI agents secured the area around the house, NBC News reported. 12:49 GMT: Russia's President Vladimir Putin said the Boston Marathon bombings are a "disgusting" crime and offered assistance in the US investigation. Location appears close to original Watertown shoot out scene. 12:46 GMT: Police getting ready to storm house, suspect possibly inside. 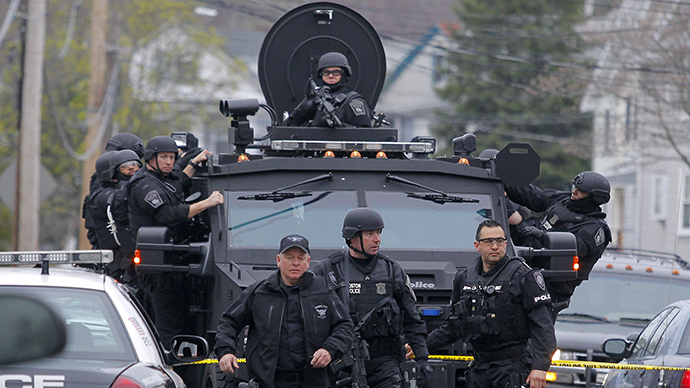 12:43 GMT: Armored vehicles and law enforcement officers gathering near Watertown, Mass. home. Officers yelling, "Come out!" News Breaker reported. 12:42 GMT: FBI releases photograph of second suspect still at large. 12:34 GMT: Police are evacuating people from the Norfolk Street in Cambridge, Mass, Bloomberg reported. 12:33 GMT: The first suspect in Boston Marathon bombings, who was shot, posted on his YouTube account videos related to terrorism. 12:23 GMT: Dzhokhar Tsarnaev with brother, 2 sisters, family moved to US in 2002 - Dagestan school spokesman to RT. 12:05 GMT:Mass. Gov. Deval Patrick:“We're making significant progress, but it may take hours”. 12:04 GMT:“There is a massive manhunt underway” - Mass. Gov. Deval Patrick. 12:03 GMT: People are being asked to find shelter inside and lock doors and open up only for police - Mass. Gov. Deval Patrick. 11:59 GMT: Police is focusing their investigation around the Norfolk Street and are shutting down the street in their search for the second suspect, NY Times reported. 11:52 GMT: Dzhokhar Tsarnaev's brother Tamerlan was reportedly arrested in 2009 for after assaulting his girlfriend. 11:46 GMT: Dzhokhar Tsarnaev brother, second Boston bombing suspect reportedly identified as Tamerlan Tsarnaev, 26, NY Times reported. 11:41 GMT: Federal Aviation Administration closed low-level airspace over NW Boston, Reuters reported. 11:36 GMT: RT found out that Boston Marathon bombing suspect Dzhokhar Tsarnaev went to school in Makhachkala, the capital of the Republic of Dagestan between 1999 and 2001. 11:31 GMT: Russian comments were posted on suspect Dzhokhar Tsarnaev’s VKontakte (In Contact) page regarding his connection to the Boston Marathon bombing after the news broke. 11:21 GMT: Around 381,000 people remain under shelter in Massachusetts, NBC News reported. SWAT team is ready to move in on a apartment where they found blood. 11:16 GMT: Dzhokhar A. Tsarnaev's name listed among recipients of Cambridge scholarships in 2011. 11:13 GMT: Alleged Boston bomber Dzhokhar A Tsarnaev last seen on his page in Vkontakte roughly 10 hours ago via mobile. Recapping--latest person taken into custody NOT the suspect. 11:01 GMT: NBC report claims the two Boston Marathon bombing suspects immigrated at least two years ago and one of them is said to have Massachusetts drivers’ licenses. 11:00 GMT: Surviving Boston Marathon bombing suspect Dzhokhar Tsarnaev reportedly lived in Turkey before arriving legally in the US about a year ago – AP. 10:36 GMT: All Boston public school activities have been cancelled. 10:33 GMT: Boston police are reminding residents of Watertown, Waltham, Newton, Belmont, Cambridge and Allston Brighton to stay indoors. Police are NOT standing down. Active search still happening in Arsenal and Dexter area. 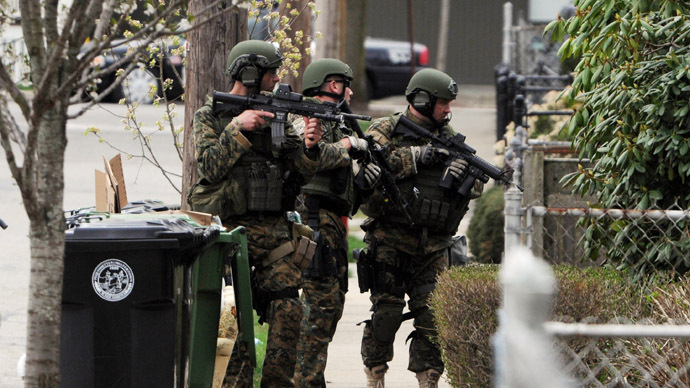 10:22 GMT:Police have reportedly detained 3 people in Watertown: "We got him - he's in custody right now" – police dispatch. Person in custody police are yelling. 10:11 GMT: Harvard University, MIT and Emerson College cancel classes, citing security concerns. 09:58 GMT: Police suspend vehicular traffic in and out of Watertown. 09:51 GMT: The two suspects in Watertown are the same two men thought to be involved in the Boston Marathon bombing – Boston police. 09:45 GMT: Massachusetts Bay Transpiration Authority is suspending all service until further notice – Boston police. 09:13 GMT: Suspects reportedly have international links and have been residing in the US legally for about a year, according to NBC News. Second MBTA bus has arrived to pic up people being evacuated. Don't leave home until police give the okay. Scanner: Report that first suspect (dead) may have detonated an explosive on his chest in custody. Second "may have explosive on his person"
08:27 GMT: Boston police - The suspects threw several explosion devices from the car as they fled from police in a van. 08:26 GMT:“We are not prepared to talk about identifications” – Boston police. 08:23 GMT:“We believe this to be a terrorist. We believe this to be a man who has come here to kill people.” – Boston police. 08:22 GMT: Second suspect is identified as light-skinned, Caucasian male – Boston police. 08:21 GMT: Boston police confirm that one suspect has been shot and a second is still at large and is considered armed and dangerous. 08:08 GMT: One suspect dead, the other remains at large and is identified as wearing a white hat, armed and dangerous – Boston Police Commissioner. Dexter St, where we heard most of the shooting and explosions, is still the main location of suspect search and undetonated bombs. 07:51 GMT: A transit officer is being treated at a local hospital for gunshot wounds after hunt for bombing suspects in Watertown - MBTA spokesman. 07:43 GMT: Bomb squad arrived on Arsenal St in Watertown. 07:17 GMT: A 20-block perimeter was established as the manhunt for the second suspect continues. 07:16 GMT: One of the men who were chased by the police has been shot dead, Boston's WHDH TV news reported. State Police officially say possible link to marathon bombing and likely link to murder of MIT officer. 07:09 GMT: Police dispatch described the suspect as a 5'11" 200lb "dark skinned white male" wearing a black top, making a getaway "on foot in unknown direction". 07:05 GMT: The other chief suspect in Boston Marathon bombing remains on the loose in Watertown after a firefight with police, according to Boston Globe. 07:00 GMT:One suspect in Boston Marathon bombing arrested, Boston Globe reported. 06:54 GMT: FBI releases new photos of two Boston Marathon bombing suspects leaving the scene. 23:50 GMT: The fire at JFK Library that followed the Boston Marathon bombing was not linked to the attack and was accidental, according to the Boston Fire Department. 22:09 GMT: The FBI website appears to be back online after a likely inundation following the press conference. 21:33 GMT: DesLauriers said the Bureau “initially developed a single person of interest” upon identifying a male with a white hat who appeared to put a black bag in front a restaurant at the finish line. “As you can see, the quality of the photographs is quite good, but we will continue to work on developing additional images,” DesLauriers said before warning the public to disregard any images not released by the FBI. Images of the two men are available on the FBI’s website. 21:32 GMT:FBI agent in charge of the investigation Richard DesLauriers released photographic and video images of two suspects in the Boston Marathon attack walking together towards the finish line. He said “identifying and locating those responsible” for the bombing is law enforcement’s top priority right now, adding that the images released at the press conference should be the sole pictures run in the press. The two men are the FBI’s “sole interest” at this point, DesLauriers said. The suspects are considered "armed and extremely dangerous." 21:03 GMT: The FBI briefing in Boston will start in moments. Officials have placed two easels cloaked in black on the stage. Multiple media outlets have reported that the Bureau will release surveillance images of at least one bombing suspect. 16:17 GMT: Obama remarks on terrorist attack and vows to catch person or persons responsible. "Yes, we will find you. And yes, you will face justice," says the president. 16:14 GMT:"Your resolve is the greatest rebuke to those who committed this heinous act," says Obama. 16:09 GMT: Crowd erupts with applause when the president says, "Boston's your hometown, but we claim it a little bit too." 16:06 GMT: Obama tells crowd: "In an instance, the day's beauty was shattered. A celebration became a tragedy. And so we come togehter to pray and mourn and measure our loss, but we also come together today to reclaim that state of grace." President Obama is now addressing the crowd. 15:00 GMT: Interfaith ceremony in Boston has begun with US Pres. Barack Obama in attendance. 14:52 GMT: US Homeland Security Secretary Janet Napolitano says that the Federal Bureau of Investigation wishes to speak with two men spotted in one of the surveillance video clips of Monday's bombing, but would not go as far as to say that they are suspects in the investigation. 11:47 GMT: President Barack Obama is scheduled to visit Boston Thursday to attend the memorial service in honor of the three people killed and to pray for the 170 injured in the marathon explosions. 22:50 GMT: Investigators believe the owner of a hotel near the Boston Marathon finish line has mistakenly found a component of one of the bombs on the roof of his building. Law enforcement officials said the piece, a pressure cooker lid, could be a valuable piece of evidence in their search for a suspect. Hotel owner Mark Hagopian admitted that the man who found the component should not have been on the roof of the building. "Police told us to clear it ," he said. "I don't know how he got on the roof, so the cooker lid was found by luck ." 22:48 GMT: Fans attending the Boston Bruins hockey game Wednesday night and Boston Red Sox baseball game Friday will not be allowed to bring backpacks into the events as Bostonians begin adjusting to tighter security measures around the city. 21:28 GMT: Massachusetts Governor Deval Patrick says no suspect has been arrested or held in custody in connection with the Boston Marathon bombings. He told CNN that the investigation is going to take time, urging the public to have faith in law enforcement agencies and to be patient. 21:13 GMT: The City of Cambridge, Massachusetts announced that a candlelight vigil will be held at 7:00 PM local time to "offer comfort and support" to the victims of the tragedy. Vigil organizers encouraged parents around the world to use the explosion as a "teachable moment" while explaining the events to their children. 20:59 GMT: Doctors have carried out at least 13 leg amputations. George Velmahos, the chief of trauma surgery at Massachusetts General Hospital, said each of which was a difficult but necessary decision. "We just completed the ugly job that the bomb did," he told reporters Wednesday. "These patients came to us with completely mangled, destroyed extremities, hanging by shreds of muscle and skin. We had to go through the unfortunate task of completing the amputation." 20:41 GMT: A law enforcement source told the Associated Press that investigators have "an image of a potential suspect in the Boston Marathon bombings but do not have his name." The source came forward on the condition of anonymity but said police found the picture after scouring pictures and video. 20:25 GMT: US Attorney Carmen Ortiz announced that the press briefing scheduled for 21:00 GMT has been postponed, citing the bomb scare at Moakley Courthouse. It was not immediately clear if another press conference would be scheduled for Wednesday. 20:18 GMT: Officials at three Boston hospitals said Wednesday that they expect their most seriously injured patients to survive. A five-year-old boy is among the 19 patients still being treated at the Boston Medical Center but a doctor told reporters that all are making progress. Dozens of patients have been released from ten area hospitals that admitted a total of 170 patients after the explosions. Boston's Children's Hospital has released seven of its ten patients, although a 10-year-old boy with multiple leg injuries and a 9-year-old girl are still in critical condition. A 2-year-old boy with a head injury is listed in good condition. 19:50 GMT: Boston Police have been given the “all clear” signal and buildings have been re-opened, ABC reports. 19:29 GMT: Brigham Hospital has stated the partial evacuation was due to suspicious car nearby and that people are now being allowed back into the building, Bloomberg reports. 19:21 GMT: Scores of people could be seen leaving the building, Reuters reports. Nearby Brigham & Women's hospital was also reportedly evacuated. No further details are immediately available. Federal courthouse evacuated;hundreds outside. People are being pushed back from building. Coast Guard and police boats in water. 18:39 GMT: Boston police have denied the latest reports that a suspect has been arrested and confirmed that no one was taken in custody, NBC reports. 18:23 GMT: The suspect was reportedly on the phone while placing the bomb. Cell records led to his identification, CBS reports. 17:49 GMT: A suspect in the Boston Marathon Bombing has been arrested, law enforcement official said, AP reports. He is expected in federal court. 17:37 GMT: Boston University has confirmed that the third person killed in Monday’s Boston Marathon was Lingzi Lu, a graduate student from China. 17:31 GMT: Boston authorities have developed "solid leads" and are "zeroing in on some people" in the bombing investigation, NBC reports citing its sources. 17:09 GMT: Law enforcement officials in Boston tell CNN that they may have identified the suspect thought responsible for Monday’s deadly bombing that has so far claimed three lives. Official announcement is expected later on Wednesday. 16:58 GMT: Capitol Police have given “all clear” to the Senate office buildings after a suspicious package and envelopes were removed. The USCP says the tests on “suspicious package” were negative. 16:29 GMT: The FBI says that an investigation into the mail containing a suspicious substance addressed to President Barack Obama and the US Senate hasn’t found a link to the attack at the Boston marathon. The secret services also informed that both letters were mailed out of Memphis, Tennessee on April 8 and had "I am KC and I approve this message" written on them. 15:48 GMT: The US Secret Service says a letter with a "suspicious substance" has been sent to President Obama. The letter was received at an off-site location away from the White House and is currently under investigation after being intercepted at a Maryland postal screening center. The FBI says that the letter to the US president has preliminary tested positive for ricin – a highly toxic oil made from castor beans. The US Senate also received a "suspicious package" on Wednesday, with Capitol Police directing all staff and personnel to avoid are directed to avoid the Atrium of the Hart Senate Office Building. 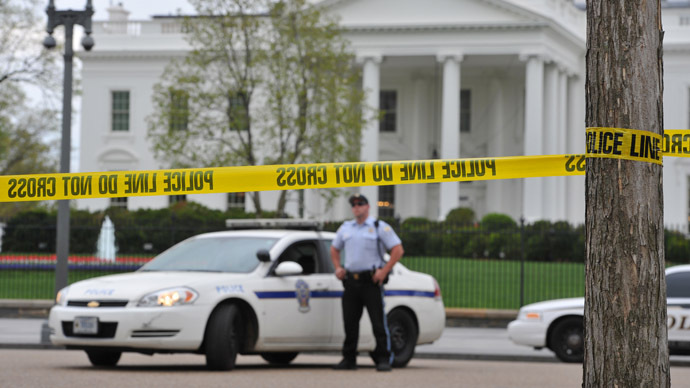 Senators Roger Wicker, Richard Shelby and Carl Levin have also reportedly received suspicious letters on Wednesday. Sources report that a man with suspicious envelopes in his backpack is being questioned on Capitol Hill. 13:42 GMT: A 5-year-old-boy injured in Boston blasts is in a critical condition in Boston Medical Center, CNN reports. Along with the boy there is one other critical person, after 11 patients were listed as critical in the immediate aftermath of the Boston Marathon bombings, Dr. Peter Burke, the chief of trauma care, said on Wednesday. Ten more patients are in a serious condition and seven are listed as being in a fair condition, he added. 12:56 GMT: Ten to 12 patients who were in critical condition at Boston Medical Center are now making steady progress, with only two remaining listed as critical, according to the hospital officials. 12:00 GMT: Lid to pressure cooker believed to have been used in Boston bombings has been discovered on a rooftop, according to an official quoted by CNN. 09:30 GMT: News, a state-run Chinese newspaper, has revealed the name of the third person killed in the Boston bombings as Lu Lingzi, who reportedly was watching the race near the finish line. 04:56 GMT: Muslims all across the globe voice their support and prayers for the blast victims. 04:45 GMT: Of the 183 people injured in the Boston bombing, 13 had amputations, according to hospital officials, as quoted by CNN. 23:34 GMT: The Boston University student killed in the attack was a Chinese national, the Chinese Consulate General in New York has announced. 22:04 GMT: The third, previously unnamed death in the attack was a graduate student at Boston University, the school confirms. The student had been attending the race as a spectator, and was with a friend who was also wounded but survived. 21:48 GMT: Special Agent in Charge Richard DesLauriers of the FBI tells a press conference that "someone knows who did this." "Regarding who might be suspected, the investigation is in its infancy," he says, adding later that "The range of suspects and motives remains wide open." Officials at the presser asked local businesses in the area of the attack to preserve any closed-circuit videos so they can be inspected, and for anyone with information on who might be behind the attack - such as anyone who was witnessed to be doing research on bomb-making - to come forward with tips. "Those items have been recovered and sent to the FBI’s Laboratory in Quantico, Virginia. There, specialized examiners will reconstruct the device and determine its makeup and components. Among items partially recovered are pieces of black nylon—which could be from a backpack—and what appear to be fragments of BBs and nails possibly contained in a pressure cooker device. We are expediting this blast evidence to our Laboratory in Quantico, Virginia for a complete and thorough analysis." 21:19 GMT: President Obama will visit Boston on Thursday in light of the attack, the White House says. 19:45 GMT: Saudi student who was interviewed by police and whose apartment was searched earlier Tuesday is not a suspect in the attack, both US law enforcement and Saudi embassy officials said. 19:28 GMT: Police Commissioner Raymond Kelly said earlier Tuesday that NYC police have received 77 reports about suspicious packages in the last 24-hours following the Boston bombing. “In a 24-hour period similar to this a year ago, we had 21 suspicious packages," Kelly pointed out at the press conference held by Mayor Bloomberg and the Police Commissioner. 19:15 GMT: Bomb squads are en route to Manhattan after suspicious packages are found at the Brooklyn battery tunnel and in front of the Javitz center, local media reports. 18:56 GMT: No indication Boston bombings are part of broader plot, US homeland security secretary Janet Napolitano says. 18:50 GMT: Recently identified Krystle Campbell was a 29-year-old restaurant manager, AP reports. According to her father, William Campbell, she was with her best friend, waiting to take a picture of the friend's boyfriend crossing the finish line. According to Mr. Campbell, the friend sustained serious injuries in the explosion. 18:08 GMT: The second victim in the Boston marathon bombings has been identified as Krystle Campbell of Arlington, local media reports. 18:00 GMT: Italian police have heightened security at major sights following the Boston marathon blast. Police forces were called on to guard the American embassy, consulates and various US institutions in the country. Upper security checks have been ordered at travel hubs such as Rome's major international airport Fiumicino. Flights considered "at risk or sensitive," namely on American or Israeli carriers, are being thoroughly checked. 17:40 GMT: The father of eight-year old Martin Richard, who died of injuries sustained in the blast, has issued a statement thanking family and friends “for their thoughts and prayers”. “My dear son Martin has died from injuries sustained in the attack on Boston. My wife and daughter are both recovering from serious injuries. We thank our family and friends, those we know and those we have never met, for their thoughts and prayers. I ask that you continue to pray for my family as we remember Martin. We also ask for your patience and for your privacy as we work to simultaneously grieve and recover. Thank you,” Bill Richard said. 17:01 GMT: A person, who briefed on the Boston Marathon investigation and spoke on the condition of anonymity, said that the explosives were hidden in 6-liter pressure cookers and placed in black duffel bags, AP reported. The explosives contained nails, ball bearings and shards of metal, but it is still unclear what was used to trigger them. Some of the bomb components are now in the hands of investigators. 15:09 GMT: US Airways Flight 1716 was stopped on the ground at Boston's Logan Airport as a precaution, Bloomberg also reported following the news from New York. 15:08 GMT: The central terminal of NY’s LaGuardia Airport has been evacuated after a suspicious package was found, Bloomberg reports. 13.59 GMT: The total number of casualties is 176 people, including three dead, while 17 are in a critical condition. “We are processing the most complex crime scene in the history of our department,” Police Commissioner Edward Davis says. Currently the crime scene has gone down from 15 to 12 city blocks, he told journalists. 13:50 GMT: There are no known additional threats and law enforcers are continuing to interview witnesses, says FBI Special Agent in charge of the Boston Division Richard DesLauriers. "Our mission is clear - to bring to justice those responsible for the Marathon bombing," he added. "We have received voluminous tips over the last 18 hours since the incident," said DesLauriers. 13.30 GMT: Boston Police are about to start a media conference on the investigation of the Boston Marathon blasts. 13:13 GMT: A 12-block area around the crime scene remains shut down to the public until further notice. 13:06 GMT: The number of injured is said to have climbed to 152, CNN reports. The death toll remains at three. 12:57 GMT: A European security official says initial evidence indicates that the attacks were not the work of suicide bombers. He spoke on condition of anonymity as he was not authorized to talk to media. "So far, investigators believe it was not the work of suicide bombers, but it is still too early to rule it out completely," AP quoted the official. 12:40 GMT: Investigators are seeking a suspect in the deadly Boston blasts whom they describe as “darker-skinned or black male” with a backpack, local media reports. Police are also looking for a yellow van. 12:24 GMT: The mother of Martin Richard, eight, killed in one of the blasts, reportedly underwent surgery late Monday for an injury to her brain, local WHDH-TV reports. Martin’s sister, six, whose name was not made public, is said to have lost her leg. The status of his father, William, has not been released. 11:59 GMT: Organizers of the London Marathon, which is to take place this coming Sunday, are on high alert as British officials urged a review of security measures, according to Britain's Sports Minister Hugh Robertson. 11:29 GMT: Boston Airport and hotels have reopened and maintain business as usual after the bombings. Airlines are allowing passengers to reschedule their flights. 10:31 GMT: Boston hospitals are treating 126 patients after Boston Marathon explosions, NBC News reports. 09:54 GMT: An eight-year-old boy identified as Martin Richard, who was among the three confirmed dead in the Boston Marathon explosions, was waiting to give his father a hug at the finishing line when the bomb went off, the Boston Globe reports. The boy was waiting on the sidelines with his mother, brother and sisters. The mother and one of the sisters also received serious injuries from the blast. 08:48 GMT: Online Reddit users have been uploading eyewitnesses’ pictures of the Boston Marathon blast and putting their minds together to help the police identify possible suspects. Police have not yet identified suspects. 08:13 GMT: The Pakistani Taliban has denied any role in the bombings at the Boston Marathon, AP quoted the group's spokesman Ahsanullah Ahsan as saying. 07:52 GMT: NBA cancels Boston Celtics' home game against the Indiana Pacers scheduled for Tuesday night due to Boston Marathon explosions. 07:36 GMT: Two devices that were used as bombs at the Boston Marathon used gunpowder as the explosive and were stacked with ball bearings and other shrapnel to induce more injuries, Reuters quoted a senior law enforcement official. 07:21 GMT: According to media reports, investigators discovered possible additional five undetonated explosive devices around Boston area, the Wall Street Journal reports. 06:57 GMT: The injury toll has gone up to 144, Boston Globe reports. 06:30 GMT: People are offering their help to those in need after the twin Boston explosions by listing their homes as places to stay for free in Boston through an open Google Doc. Also, Google has launched an online Person Finder tool to help connect people who are still cannot find their friends or family members. 05:15 GMT: Boston police are expecting to analyze more video footage taken by the witnesses of the Boston Marathon explosions. The Police Department has requested public records from the explosions, especially videos of the finish line. 05:05 GMT: Press conference to be held Tuesday, April 16 at 9:30am local time at the Westin Copley Plaza, Boston Police reported quoting Media Advisory from the FBI. 04:44 GMT: Boston Children's Hospital is currently treating various victims including a two-year-old boy with a head injury, a nine-year-old girl with leg wound and six other children under the age of 15, Reuters reported. Twenty-nine more victims are at the Massachusetts General Hospital with injuries ranging from cuts and bruises and serious wounds from the explosions. 04:03 GMT: Police have reportedly searched an apartment in the Boston suburb of Revere, in relation to the Boston Marathon blasts. Massachusetts State Police have confirmed that a search warrant had been issued Monday night, but declined to comment further, according to WBZ-TV. 04:00 GMT: The 'person of interest' who was questioned at the hospital was apparently a Saudi national with a student visa and clean record, sources told ABC News. 03:34 GMT: A statement from the Boston Athletic Association, which organized the marathon, expressed sympathy for the bombing victims and reminded attendees that, when faced with death and destruction, athletic results are of little consequence. “We would like to thank the countless people from around the world who have reached out to support us today,” the statement read. 02:51 GMT: Google's Boston Marathon Explosions Person Finder, which allows people who are either looking for someone or have information on someone affected by the attack can register such information, says it is currently tracking more than 4,800 records. — Boston Police Dept. (@Boston_Police) 16 апреля 2013 г. 02:14 GMT: “Several amputations” have been performed on the patients injured in the incident, Massachusetts General Hospital says. "I think absolutely everyone around me thought that it was just somewhat expected fireworks as it was so close to the finish line. But then we heard the second explosion and it was much closer to us. Almost everybody started to run! Runners were asking to use our phones so they can text their family and tell them they were fine." 01:20 GMT: Boston police say they have no suspect in custody. The first explosion blew down and away; I saw many lower torso wounds. Boston PD, EMS, and Fire responded very quickly. 00:57 GMT: A third fatality has been confirmed by Boston Police Commissioner, Ed Davis. "I offer my sympathies to the families impacted by this horrible tragedy. Those responsible will be brought to justice," he said at a press conference. 00:45 GMT: FBI has taken over the investigation into the blasts. "A multi-agency response including state and federal law enforcement agencies has been activated and is investigating the cause of the explosions along the Boston Marathon route and elsewhere," FBI said in a statement. "The situation remains fluid, and it remains too early to establish the cause and motivation." 00:41 GMT: Five supposedly additional, undetonated explosive devices have been found by police in the Boston area, WSJ reports. 00:40 GMT: RT's Marina Portnaya is Live in New York with the latest. 23:50 GMT: The injury toll has gone up to 132, of whom eight are children - area hospitals report. The tragedy has claimed the life of an 8-year-old boy, police say. Boston Children’s Hospital says it has treated a 9-year-old girl, a 7-year-old boy, a 12-year-old, and a 2-year-old. 23:15 GMT:Family members of the victims killed in the Sandy Hook Elementary school shooting last year were seated near the site of the first of the two coordinated explosions at the Boston Marathon Monday, adding more heartbreak to the already tragic day. Race officials said their presence was of "special significance" because the marathon is 26.2 miles long while 26 people were killed in the shooting. 23:00 GMT: In response to the multiple blasts and additional explosives found in Boston during its annual marathon, America's larger cities are heightening security measures as a precaution. 22:52 GMT: "The scenes from Boston are shocking and horrific - my thoughts are with all those who have been affected," UK Prime Minister David Cameron says, according to Sky News. 22:41 GMT: According to a law enforcement official quoted by NBC News one of the two fatalities was an 8-year-old child. 22:30 GMT: President Obama was careful to avoid blaming terrorists while reassuring Americans that investigators "will find out who did this and hold them accountable." He added, "We do not know who did this or why." 22:05 GMT: FBI identifies the explosions at the Boston Marathon as terrorist attack. 21: 59 GMT: Police Commissioner denies any arrests have been made but "multiple people" are being investigated. There is a "heavy police presence" at every hospital in the city. 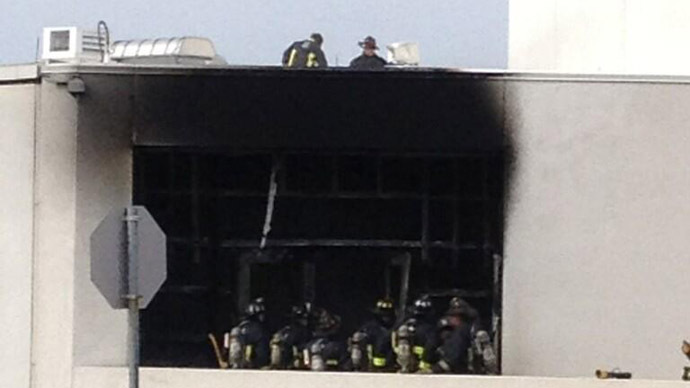 21: 56 GMT: Boston police report the supposed explosion at JFK Library was a fire. It has not been linked to the explosions at the Boston Marathon. 21:44 GMT: FBI Director Bob Mueller and Homeland Security Secretary Janet Napolitano have briefed US President Barack Obama about the ongoing investigation of twin explosions that hit the Boston Marathon on Monday. 21:31 GMT: Boston police denied a claim by the New York Post that a 20-year-old Saudi Arabian national was in custody as a suspect in the blasts. 21:25 GMT: Police have asked people in immediate area of explosion to refrain from using mobile phones. Please note: the FAA has announced a ground stop for Boston Logan airport until further notice. 21:10: Cellphone service is reportedly down in Boston. Cellphone service is down in #Boston. Use #texts, #email, or #social media. 21:19 GMT: The number of injured rises to at least 100 people, the Boston Globe reported on Twitter. 21:04 GMT: Time reporter Andrew Katz reports via Twitter that "another device" has been discovered in front of the luxurious Mandarin Hotel in Boston. The information comes from a police scanner. 21:00 GMT: Some media have reported that a suspect is in custody at a Boston hospital, though the claim has not been officially confirmed. A source told the New York Post that a 20-year-old Saudi Arabian national was under guard at the hospital, though it was not made clear whether or not he was injured. 20:55 GMT: "We are not certain that these incidents are related, but we are treating them as if they are," Boston Police Commissioner Ed Davis told a news conference. 20:51 GMT: Boston police commissioner urges people to stay indoors, not congregate in large groups. 20:50 GMT: At least six of the 28 injured are in critical condition, hospital officials say. 20:41 GMT: Police have confirmed a third explosion in Boston. This time at the JFK Library, there yet have been no reports of dead or injured. 20:35 GMT: Police are now getting reports of multiple other unexploded devices around Boston. 20:20 GMT: FAA imposes partial no-fly zone following Boston marathon explosions. 20:13 GMT: An intelligence official working on the scene told the Associated Press that two additional explosive devices were found near the site, and are being dismantled by a bomb squad. An explosion just went off in downtown Boston. Spectators fleeing the #bostonmarathon course.